Coriander, five spice and soy make this a super-tasty meal. You can also marinate the chicken and make the salsa in advance, so when you’re ready to cook you’ve got an instant meal. Mix 4 tbsp of the soy sauce with the five spice, ground coriander, garlic and chilli flakes in a bowl, stir in the chicken so it’s well coated, then pop in the fridge to marinate for at least 30 mins. Thread the chicken onto wooden skewers and place in a foil-lined grill pan or on a barbecue. Brush with the remaining marinade, then grill for 10-12 mins, turning occasionally, until the chicken is golden brown and cooked through. Meanwhile, mix the tomatoes, red pepper, fresh chilli, ground black pepper and coriander to make a salsa, and steam the mangetout and pak choi until just tender. 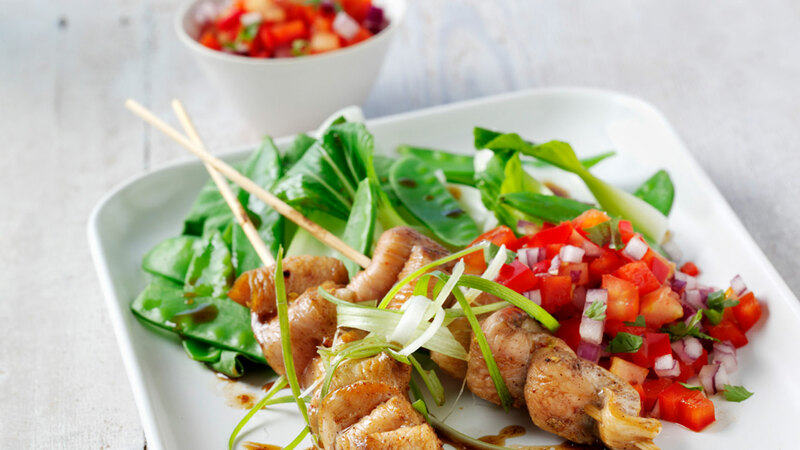 Serve the kebabs, vegetables and salsa drizzled with the remaining soy sauce, topped with the spring onions.